Pinterest is known as a virtual pinboard where you can share and manage online images and videos you find online. Most probably you have been using it to collect beautiful and interesting stuff your find online and so far there could be numerous boards and pins you are having in your personal account. Pinterest is a tremendous service which hits online users with an innovative idea and people loved the way it works. Unlike other social profiles, Pinterest personal accounts could be used for businesses without a doubt as it was all about pinning. A personal profile with business name on it just do that for businesses. Isn't it? I used to have a personal account set up for my blog just to pin content from my blog for followers who interested in my blog posts. I have my own personal account to pin what grabs my attention too. Anyway, if you are like me who were managing another account for your business, now Pinterest offering a new way of promoting your business on Pinterest to engage with pinners interested in your business - Pinterest Business Account. I'm sure you have heard of Facebook fan pages, Google+ pages or LinkedIn company pages and now it's the Pinterest version of it. If your business not best fit with above categories, Pinterest have another category you can use - Other. In addition to business types, business accounts simply let you enter your business name directly. 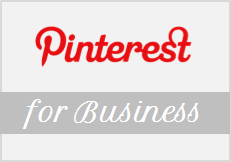 You can expect more benefits and features specific for Pinterest Business Accounts as Pinterest develops their business model and for now the best you can do is if you wanna go with your business, have a Pinterest Business account for it. Though Pinerest business accounts follow the same functionality as personal accounts, there are few things I would like to suggest you to go through when you start with business accounts. As it's more about exposing their businesses, there are new terms for business accounts that you need to aware of. Take few minutes to go through and learn about them. Finally, one of best things I've seen with the emergence of Pinterest for business is that Pinterest offering tips to get most out of your Pinterest business account. If you are gonna have a business account on Pinterest, make sure you go through What Works page to get inspired and use Pinterest effectively for your business. It is a great resource if you have no idea how to get started with your business account and how it can be differ from personal accounts. Shall we get started? If you already have a Personal Pinterest account set up for business, you can convert it for a business account instantly while preserving all your pins and boards. Navigate to Account Conversion page and fill up necessary information to start as a business account. 1. 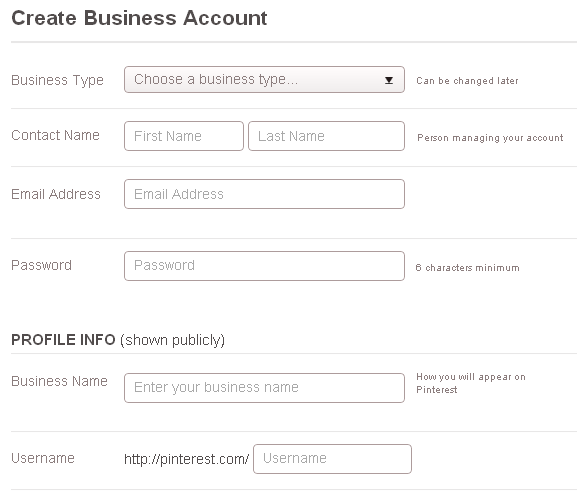 Go to Pinterest for Business Account Creation page. 3. Click Create Account button. Mayura, I could not find the settings since mine were started before they offered this - I wonder what that will or will not do? That's cool :) Verification helps to expose the URL and I'm glad if Pinterest offer meta tag or verification tag for non self-hosted blogs. Anyway it means you are managing multiple Pinterest accounts? :O Where do you find the time? Interesting Mayura. I just verified mine for the retail sites but I don't remember doing this. Thanks for reminder. I will have to double check this one out Mayura ~ Good tips as always! Or, maybe I should be calling you Mr HowTo? ;) I know about the Pinterest Business account, but I have never bothered to get me one. I had heard about the business account for Pinterest but never really thought to go in for them because I have 2 blogs, one for writer's and the other one for family, life, self-development, and I was just confused as to what business would I use it for and what name to give it too - so I shelved the idea, and prefer using my personal account instead. However, for those who have a single blog, these business accounts would be a wonderful idea to increase your traffic and pin each others posts too. I do have a few friends who have their business accounts like you mentioned here.That reminds me I've yet to create my G+ business page too, which again for the above mentioned reason I didn't, though I really don't miss it much - but it's good to have one nevertheless. Well, I think it's more about brand recognition Harleena :) Mostly bloggers are seeking for traffic and personal accounts can help 'em well as anyone can pin of follow you. Let's see what features will come for business accounts in future and then you can decide which way to go. Thanks for this post! Your blog is great... excellent tutorials. New fan/follower! B-) ---- I didn't know about the business accounts. Is there a way to have multiple personal accounts? Is there a way to have multiple BUSINESS accounts? I own several different websites and would like to start Pinterest boards for some. Yeah, you can :) Each of your business account needs a unique email to sign up and verify your Pinterest account.